On July 4, the final Dash 8-300 flight at American Airlines’ regional carrier Piedmont Airlines landed at Salisbury, Maryland, at dusk from Charlotte, North Carolina. American was the final operator of turboprops among the Big Three carriers and their affiliates, joining Delta Airlines and United which no longer fly prop planes. Both Delta and American first began operations in 1928. American followed in 1936. Piedmont began flying the Dash 8-300 in May 1985. The retirement of American’s prop planes followed similar decisions at Delta and United, which have replaced them with a mix of Bombardier and Embraer SA regional jets. American replaced the Salisbury flights with Embraer 145 jets. The turboprop is hardly gone from U.S. skies. Horizon Air, a subsidiary of Alaska Air, still flies the Bombardier Q400 and Empire Airlines flies the ATR 42-500 in Hawaii for Hawaiian Holdings’s Ohana division. And here in Canada, Air Canada, WestJet and Porter among others rely heavily on the Dash 8 to move passengers around. But the heyday of turboprops is certainly over, according to Richard Aboulafia, vice president, analysis, at Teal Group, an aerospace consulting firm in Fairfax, Virginia. While the turboprop market is “stable,” it is a fraction of its former self and mostly for non-U.S. carriers. And the Q400 isn’t doing as well as the ATR which is using the Bombardier aircraft as “a punching bag,” said Aboulafia. However, Q400 sales shouldn’t be affected by the A220 (formerly CSeries), which is starting to gain traction as part of Airbus after a slow start out of the gate. So, no threat of the A220 cannibalizing sales of the Q400, added Aboulafia. One of the big issues was the fact Bombardier was dedicating so many resources in getting the CSeries to market, that its other programs were being neglected, including the Q400. That enabled the ATR to leap ahead of its rival in terms of new technologies and cabin design. The company said as much at the Farnborough Airshow in July when Patrick Baudis, vice president of marketing, Bombardier Commercial Aircraft, said in an interview with Aviation Week that Bombardier was focused on regaining market share for its CRJ and Q Series aircraft. He also pointed out that they’ve upped their game, capturing 40 per cent of regional aircraft sales last year between the CRJ and Q400 thanks in part to a new 90-seat Q400 (pictured above). 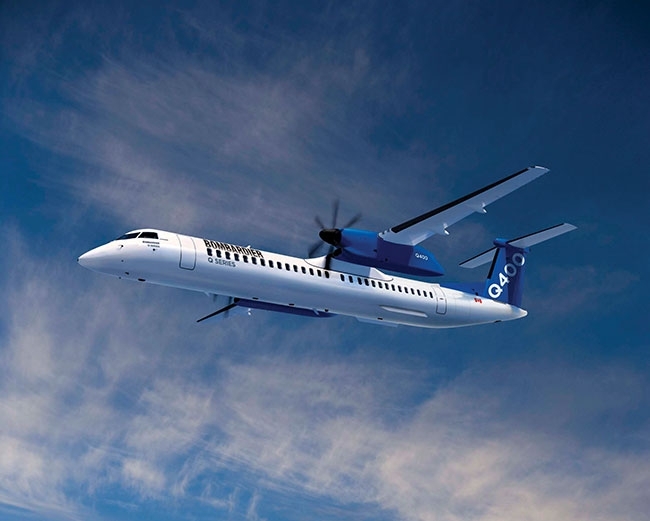 The Q400 received another vote of confidence at Farnborough in another interview in the same publication with Bombardier Commercial Aircraft president Fred Cromer who was debuting the company’s Atmosphere cabin in a Delta Connection CRJ 900 regional jet. Cromer said the company is considering adopting the cabin for the Q400 which has been described as a “game-changer” for regional aircraft. Essentially, the cabin offers better lighting and larger overhead bins found in larger aircraft. Larger bins are the top request for regional aircraft operators, according to Cromer. The smaller bins on regional aircraft have often resulted in luggage being taken off passengers at the gate and placed in the hold, which is both time-consuming and unpopular with travellers. The CRJ also has what Bombardier claims is the first full mood lighting in a regional aircraft. The lighting and cabin moldings help make the new CRJ more spacious. The mood lighting is also being considered for the Q400. Brian Dunn is a Wings contributor.